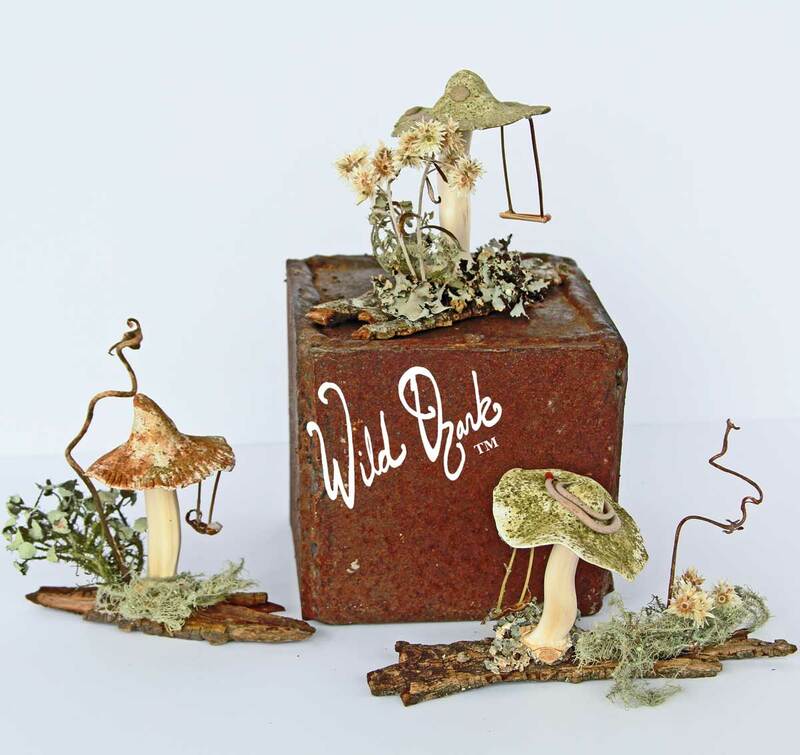 Posts tagged "botanicals used for art"
Madison Woods Nature,Nature Art,Ozark Crafts botanicals, botanicals used for art, fairy gardens, ginseng, moss, what is a nature farm? What Does a Nature Farm Produce? Today I took a little hike after feeding the horses. I was on a mission to collect moss and lichen-covered branches. These are just some of the things the Wild Ozark Nature Farm produces. And that’s how a nature farm works. I didn’t plant seeds, or till, or do anything at all to grow these products, I just have to collect them. Maybe nature does all the work of growing the produce, but, I do have to be aware of how much stress my harvest places on the the resources being gathered. I do sometimes propagate some things, like the ferns, to make sure more of them grow to replace the ones I took. I also propagate the woodland medicinals, like the ginseng, goldenseal, bloodroot, and cohosh. With ginseng I use seeds, but for the others I use root division or seeds. I make sure I don’t gather too many of the ferns from an area, even where they are plentiful. When there is a large fern, I’ll only take part of it and leave behind half of the root mass to continue growing. If it is an unusual fern, or one that won’t do well transplanted, I leave it alone. Likewise, I am careful with the gathering of moss and lichens. Moss, in particular, takes a good bit of time to regrow in some areas. For this reason, I’ll gather from a different area each year. This gives the moss time to repopulate before I go to that area again in a year or two. We follow the same practice of rotation with the bark from the shagbark hickory trees. The bark is what we use for Burnt Kettle’s Shagbark Hickory Syrup. With some things, like gumballs and acorns, there is very little chance at all of over harvesting. The same goes for the groundfall items I collect, like the lichen or moss-covered bark pieces that have dropped to the ground. So after I collect the botanicals, I can either sell them like they are, or make something else with them. Just like a traditional farmer does with, for example, strawberries. Some people want to buy the strawberries fresh and some might like some jam. 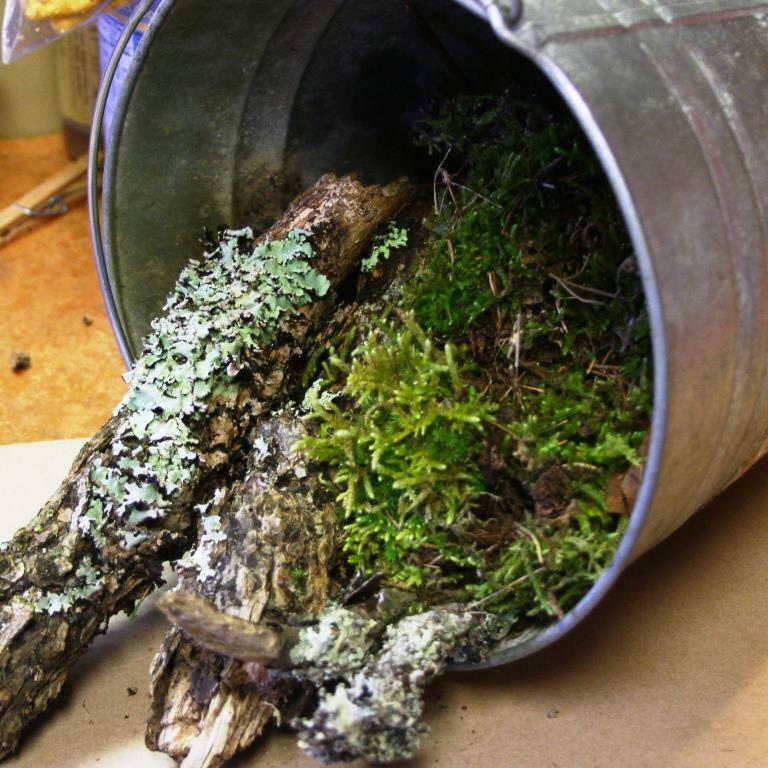 With the moss, some like to buy it fresh and ready to use in their own DIY projects, and some might like a Wild Ozark Fairy Garden. For the moss in that bag in the photo above, I’ll put it in the vegetable drawer in the refrigerator. When packaged like this in a cellophane bag, the moss stays green and alive for weeks. If it will be longer than that before I use or sell it, I’ll take it out to get some light every once in a while. I use the botanicals for various things. Packing the rootlets or the seeds on a bed of fresh, living green moss keeps them fresh far longer than without. The Wild Ozark Nature Farm provides lots of perfect habitat for growing plants like American ginseng. This endangered medicinal herb has a very narrow set of requirements to grow and I take full advantage of all the spots here that support it. I sell the seedlings and sometimes the older plants at the farmer’s markets and also ship them out by mail. Aside from the physical items directly related to growing or harvesting, the Wild Ozark Nature Farm also provides inspiration. I’m an author and artist and my work depends on this close contact with nature. Even my fiction draws on my relationship with nature. Here’s my latest work of nature art, drawn from a photo I took of a green dragon plant here at Wild Ozark. Green Dragon Drawing. Prints available. I hope you enjoyed this little tour through the nature farm. Every square inch of this 160 acres opens up worlds of possibilities and I can’t think of any other life I’d rather have!